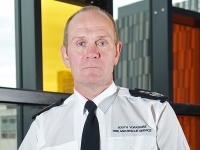 Deaths and injuries from house fires and incidents of arson have both fallen again across South Yorkshire, but the county’s Chief Fire Officer is warning that any future funding cuts will threaten recent safety improvements. Hoax calls and primary arson fires, such as house and car blazes, have also fallen to record low levels, and total calls to the fire service are down by 23%. The total number of accidental house fires in 2012/13 was 626, a reduction of almost 40% in ten years in figures revealed in SYFR’s Annual Corporate Performance Report which goes before the Fire Authority this month [June]. However, Chief Fire Officer Jamie Courtney (pictured) warns that despite the drop in call-outs, levels of fire cover across the county need to be maintained: “These figures represent another excellent year’s work from our firefighters, community safety teams and partner agencies, and we will strive to continue these improvements but this level of performance is undoubtedly threatened by government cuts to our budget. Small arson fires, such as grass, bin and rubbish, also dropped from 5,079 in 2011/12 to a record low figure of 2,266 in 2012/13 (55% decrease). Deaths and injuries from accidental house fires are down from 58 to 43 (26% decrease). SYFR’s budget will have reduced by £9.5m between 2011 and 2015, and it is likely that further funding reductions will be imposed upon fire and rescue services beyond 2015.